New Super Mario Hot Wheels series debuts later this summer — GamingWithSwag.com - Dads By Day, Gamers By Night. Last summer, Mattel had a huge hit in the gaming community with the retro throwback Super Mario Hot Wheels series. 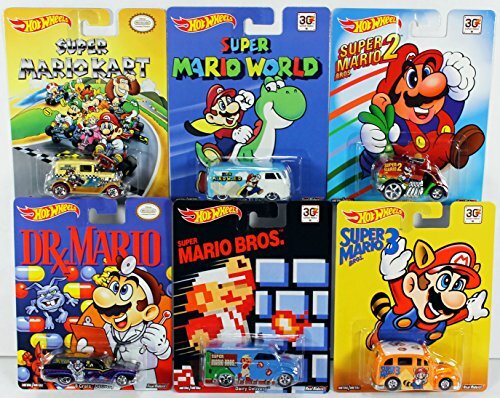 This series featured six cars that were themed based on the 8-bit / 16-bit games in the Super Mario Bros. universe. This summer, a second series of cars will be produced, this time focusing on the actual characters. This awesome, because as cool as those first series of cars was, they were still older designs with a video game theme. This series will feature all new designs that will resemble favorite characters like Yoshi, Mario, Bowser and more. This new series is scheduled to debut this August and will most likely be somewhat difficult to find. The initial batch of the 30th anniversary series was sold out quickly and didn't resurface until Christmas in minuscule amounts. These usually retail for approximately $3-$4 per car and are found in most places that carry Hot Wheels products. Also, GameStop seemed to carry the 30th Anniversary series as impulse items at their cash wrap. Click on the pictures below to see designs up close and let us know what you think. New Super Mario Hot Wheels cars are in the wild!